With fall and winter right around the corner, cold weather is imminent. While you’ll surely be singing the blues and missing the warm weather of summer, you don’t have to fret over sky-high heating and energy bills. That is, if you do your due diligence and pay attention to your home’s insulation before the first cold front comes through. The average household in the United State spends $1,900 per year on home utility bills. Of those expenses, more than $1,000 goes towards heating and cooling of the home. That’s a healthy 54 percent of your entire utility bill for the year! And while you can’t eliminate these costs, there are ways to reduce the amount you spend by eliminating unnecessary energy loss. For example, did you know that heat loss primarily occurs in four different areas of the home? Approximately 35 percent of heat loss occurs through walls, 25 percent in the roof/attic, 25 percent around windows and doors, and 15 percent through the floor. Cool air is lost through many of the same problem areas, especially doors, windows, and floors. While energy efficiency problems aren’t always easily detectable, you should know that some of the primary culprits include poor insulation, outdated or inadequate HVAC systems, holes in exterior walls, and leaky ducts throughout the home. Thankfully, there are a handful of jobs and simple fixes you can handle on your own. Addressing the following issues could help you save hundreds or even thousands of dollars down the road. Weatherstrip doors. Over time, a door’s weather seals will compress, bend, rip, and wear out. As a result, cool air pours into your home during the winter months, inflating your heating bill and leaving you with uncomfortable drafts. If you don’t know the last time your doors were sealed, it’s probably time to consider weatherstripping them. Fortunately, it’s pretty simple. You can purchase all of the materials you need from your local hardware store and the job should only take a few minutes per door. Caulk windows. Now it’s time to turn your attention towards the windows. While your windows were originally sealed at the time of installation, this seal – much like your doors’ seals – breaks down over time and exposes your home to unnecessary heat loss. The cheapest and easiest way to address this problem is by caulking your windows. It’s a fairly quick process and only costs a few dollars (which is nothing compared to the overall cost of heat loss). First time caulking windows? Check out this video. Insulate windowpanes. Another way to fix heat loss around your windows is to insulate the individual panes of your windows. This is as simple as applying transparent insulation film to the window. It can be found at any hardware store and goes on relatively quick and easy. Another option you might consider is having your windows replaced with energy efficient window from a company like Scelta Windows. Wrap your hot water tank. Poor insulation of your hot water tank can increase your energy costs throughout the winter. This is especially true if your hot water heater is stored in a garage. Thankfully, this is also an easy fix. Just purchase an insulation blanket from a home improvement store and wrap it around the heater. This typically cuts down on the amount of energy needed to heat your water. Locate problem areas. Sometimes the best thing you can do is locate the problem areas and then give the professionals a call. Many times you can simply walk around your home and take note of where you feel cold air drafts. Touch windows, walls, and floors. Climb up into your attic and identify drafty areas. The more aware you are of your home and its needs, the more you’ll be able to save. Bigger projects call for specialized expertise. The following three projects are best reserved for insulation professionals who can properly oversee the job and ensure your home meets all standards and codes. Vent and Duct Sealing. Did you know that you can lose as much as 10 percent of your home’s heat through improperly sealed ductwork? That’s an alarmingly high amount and necessitates a careful examination of all the ductwork throughout your home. Some of the different problem areas for ducts and vents include supply leaks, kinks in the duct work, return leaks, fallen duct insulation, furniture blocking a register, poorly sealed connections, and more. It should also be noted that a vent and duct cleaning can greatly improve the health of your home, by removing and killing any mold, fungus, or bacteria that’s present. Attic insulation.Your attic is a huge source of heat loss (and cool air loss during the summer months). By reinsulating, you can save between 30 and 50 percent of your overall HVAC costs. If your attic is only used for storage – and is otherwise empty – it may be beneficial to insulate the attic floor in order to trap warm air in living spaces that are actually inhabited. It’s also wise to insulate the walls and roof in the attic to keep air from escaping or entering. 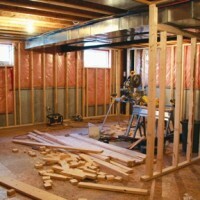 Basement or crawlspace insulation. Finally, you should pay attention to your basement or crawlspace. These problem areas need to be carefully insulated to ensure there’s no unnecessary transfer of air between the interior and exterior of your home. Insulation also helps prevent moisture from creeping into the home, which can cause expensive headaches in the future. The professionals can quickly identify issues in your basement or crawlspace and are skilled at correcting them. At Affordable Insulation, we’ve provided Oklahoma with affordable insulation solutions since 2006. We have years of experience with a number of different insulation products, including blown in insulation, blown in blanket insulation, spray foam, and fiberglass batts. Whatever your needs are, we can identify the problem, find a solution, and ensure that the project is performed at a low cost that’s conducive to your budget. For additional information regarding our services and solutions, please contact us today! We’d be happy to provide you with a free estimate.